From the buggy-yet-popular Windows 95 to the god-knows-what-it-is and upcoming Windows 8, Microsoft has come a long way. Unlike the 90’s, they aren’t just making computer software, today they manufacture almost anything your tech-savvy mind can dream of. But after all these years, what hasn’t changed is the fact that Microsoft is still a company full of uptight nerds who think that attacking their competitors is what makes them no 1. Microsoft initially had no big competitors. Everything was peachy in the rapidly-growing Gatesland. From office desktops to giant servers, Windows was having a somewhat faddish influence on the computer-curios crowd. But soon, in the shadows of this giant monster's trail, a new rival was slowly taking shape. Linux, even though slowly, was getting the recognition it deserved, posing a direct threat to Microsoft's mega empire. Microsoft, as it does with every competitor it faces, was quick to deny Linux's existence. It was only when the tiny penguin started gaining prominence in the server market that Microsoft made its first attempt at thwarting Linux's growth. In 1999, Mindcraft, a company specializing in testing and benchmarking systems, published a thorough report stating that “Microsoft Windows NT Server 4.0 is 2.5 times faster than Linux as a file server and 3.7 times faster as a Web Server”. One year prior, a similar whitepaper was published, attacking Novell Netware, claiming that “Microsoft Windows NT Server 4.0 is 25.5% faster than Novell Netware 5 as a File Server and has 2.7 times better price/performance”. The reports were convincing enough for any consumer to opt for the 'better' product, which apparently was Microsoft NT Server. Although, the truth behind the report soon came out when it was revealed that Microsoft had paid Mindcraft to create the report. Well, to give Mindcraft some credit, the benchmarking was actually carried out on a Linux server. However, the Linux system used in the test was not setup in an optimal way. Mindcraft had used the best configuration for their NT models, yet they failed to setup a Linux system that was performing to its full capacity. Thus began, Microsoft's long and dirty campaign against Linux. As Microsoft kept coming out with newer versions of its flagship Windows operating system, Linux, slowly but steadily, started growing bigger. At that time, when Windows NT and 2000 ruled the desktop world, Linux users were seen as hippies or communists by Microsoft's loyal minions. 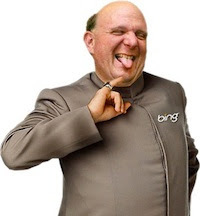 Steve Ballmer, even went as far as to say that “Linux is a cancer that attaches itself in an intellectual property sense to everything it touches”. What the badmouth Ballmer didn't realize then was that this virtually-unknown operating system would be used in cancer research some day. Post-2000, Linux became a more palpable opponent to Microsoft's giant empire. Now, Linux was not only a server operating system but also a more usable desktop OS. Microsoft, as always, was never going to back down. They started using fear as a weapon in its fight against Free and Open Source Software. They claimed that Linux developers and users (yes you heard that right) violated almost 235 of its patents. Microsoft said that they only 'chose' not to sue Linux for this. Now, this claim by Microsoft may not come as a big surprise for any experienced Linux user, but for users who were planning on switching from Windows to Linux, this was a huge hurdle. 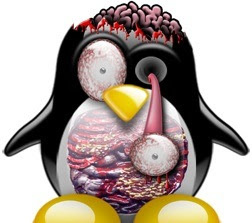 Fears and doubts were instilled in the minds of many Tux-curious users and corporations, a fear that he or she might face a lawsuit for installing Linux on his or her computer. This war took a strange, or rather shocking turn when Microsoft suddenly started supporting open source. They even began contributing code to Linux's kernel. What an altruistic move we must say. But this move was clearly a well-planned scheme by Microsoft's PR department to mend its broken image in the tech world. This is when Gatescorp started playing the game a little more carefully, by avoiding conspicuous maneuvers so that the company's brand image remained intact. Well, that didn't by any means imply that Microsoft had given up its fight against the penguin. When Linux-based netbooks started taking the world by storm, Microsoft started its ugly game again by claiming that Linux had higher return rates than Windows. The fact was that many users actually chose Ubuntu over Windows XP when it came to netbooks. Well-engineered Linux-based netbooks offered almost everything Windows offered and more. Canonical even exposed Microsoft's netbook FUD in a post on their blog. When Windows 7 came out, Microsoft started looking for new and innovative ways to continue its FUD campaign. By then, Linux was no longer a geek-only operating system. In fact, Ubuntu had become a popular name amongst developers and casual users alike. What Microsoft did here was not only evil but also something really stupid. In Microsoft's training material for Best Buy employees (called Microsoft ExpertZone), they included a module which taught how to convince customers that Linux was a bad choice when compared to Windows 7. The talking points mentioned in the course went from ludicrous to absolutely moronic at times. According to Microsoft, few of the issues with Linux were that one couldn't play World of WarCraft or download and install Windows Live Essentials. 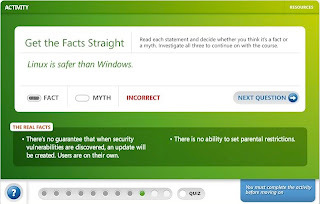 The most ridiculous part of the module was the claim it made that “Windows is safer than Linux”. 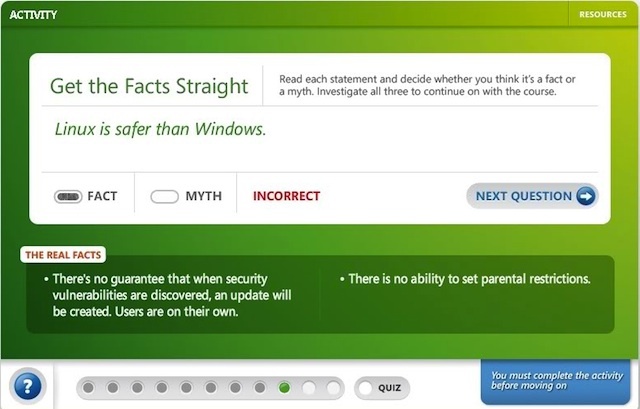 Of course, even an inexperienced Linux user would be quick to repudiate that 'claim', but no matter what the facts are, Microsoft keeps pushing its evil propaganda to consumers. Android is killing the iPhone. But in this battle of smartphones Microsoft is nowhere to be seen. Well, that's what many people believe. Here too, Microsoft is playing its evil game, however, this time, by staying behind the scenes. There has been a huge debate whether Android can be considered as Linux but for the sake of the argument let's consider it as a Linux-based OS. Now, Microsoft claims that Android OS, being a Linux-based one, is infringing many of their patents. They are demanding 15 USD in cash for every Android device Samsung makes. $15 looks like a small amount, but considering the huge number of sales the Google-made phones have achieved, it is enough to keep Microsoft happy for years. Samsung on the other hand is trying hard to negotiate a lower $10 fee in exchange for some kind of alliance with Microsoft. Appalling, absolutely appalling. The latest threat to Microsoft's million-dollar empire is Google Chrome OS. Though Microsoft has never publicly acknowledged the browser-based Operating System as a threat to their company, but Google is a competitor they can't afford to be complacent with. I'm quite sure that if Chromebooks start performing well in the market, Microsoft will start some kind of FUD or patent war against Google. Any attack on Chrome OS will be more or less an attack on Linux as it is after all a Linux-based Operating System. Linux is not the only threat to Microsoft's empire. Their old arch rival Apple has risen from the ashes to take them head on and it appears that Microsoft has run out of ways to tackle them. iPads and iPhones are selling like pancakes. Gatescorp, which once predicted that 'tablets are dead', are lamenting not being a part of this trend. Linux being open source and free was an easy target for Microsoft's FUD plot, but taking on Apple is not a child's play. Apple has a strong fan base and talking an Apple fanboy into buying something else is a huge task in itself. You Forgot the Biggest FUD Campain Ever! When is was found out that Microsoft Funded the SCO Unix Patent Infringement Law Suit against Linux, IBM, Red Hat and Novell. Or how about the Wintel campain agianst the OLPC that cheated millions of children worldwide out of a quailty education. Don't forget that the OLPC created the netbook but was forced by M$ and Intel not to openly sell it. Come on those two were bigger than any of the one's you listed. It's scarring how these guys get what they want! I think is a matter of "FOOS users of the word, unite and grow". Long live GNU/Linux!! !